Many of the world’s best athletes have run and raced in Glasgow. The Rangers Sports attracted stars in all events, the SAAA Championships have had some top stars appearing in the 1990’s when the ‘open’ nature of the event was being emphasised. We have had our own top runners of course – from Halswell and Liddell to Wells and McColgan. But there is one of the very, very best of all time who ran in Scotland and we are by and large ignorant of the fact. I speak of Paavo Nurmi the famous Finn. He did come to Glasgow and did run here with distinction – it was not for the appearance money. Alex Wilson has written the following article about the visit and provided the photographs. I’d like to thank him for the work done to produce this fascinating piece of memorabilia. .
Glaswegians have witnessed some iconic athletic moments down the years, such as at Ibrox in 1904, when Alfred Shrubb, the little Horsham wonder, demolished the world hour record as well as all amateur records from six to eleven miles. This year (2013) denizens of Glasgow relived some of the excitement of earlier days when the amazing Ethiopian runner Haile Gebreselassie visited a revitalised Glasgow for the first time and won the Great Scottish Run in a new master’s world record for the half marathon. Altogether Alfred Shrubb set 28 world records during his career, including two world cross-country titles, but unfortunately never had the opportunity to cover himself in Olympic glory. Haile Gebreselassie, between 1994 and 2009, set 27 world records at distances ranging from 2000 metres to the marathon, not counting the three masters’ world records which he set this year in the 10k (28:00), 10 miles (46:59.9) and half marathon (1:01:09). Many now consider the Ethiopian to be the greatest distance runner who ever lived, and this may be so, but like every generation of distance runners past, present and future, he stands on the shoulders of giants. Without doubt, Alfred Shrubb and Haile Gebreselassie were the world’s foremost long distance running exponents of their day. They dominated their event like few others have before or since. One of those few others is, of course, the great “Flying Finn” Paavo Nurmi who, like Haile Gebreselassie, came to Glasgow in the twilight of his career and, like Alfred Shrubb, left an indelible footprint on the cinder track at Ibrox Park. Athletics is based on facts and figures, and on that basis Nurmi arguably ranks equal to Haile Gebreselassie. Paavo Nurmi was undoubtedly the most successful of this stellar trio in the Olympic arena at least, amassing an incredible nine gold medals and three silver medals between 1920 and 1928. He might well have increased his unprecedented gold tally in Los Angeles had the IAAF not intervened and prevented him from running on trumped-up charges of professionalism. Nurmi was no less prolific than Shrubb or Gebreselassie, setting 29 world records at distances racing from the mile to 25 miles between 1921 and 1932. However neither Shrubb nor Gebreselassie had as profound an impact on racing and training methods as the Finn, who was truly ahead of his time in several respects. Nurmi was the first runner to adopt a scientific and holistic approach to training and race preparation. It is thought that he was the first runner to do interval training as part of a systematic twelve-month training regimen. His easy stride, high arm action and clockwork regularity were the product of years of hard training and meticulous attention to detail. He also pionereed the even-paced approach to racing and was famous for running with a stopwatch in hand. Many of his world records reflect his extraordinary pace judgement. He even had a special diet and practised vegetarianism for a while. 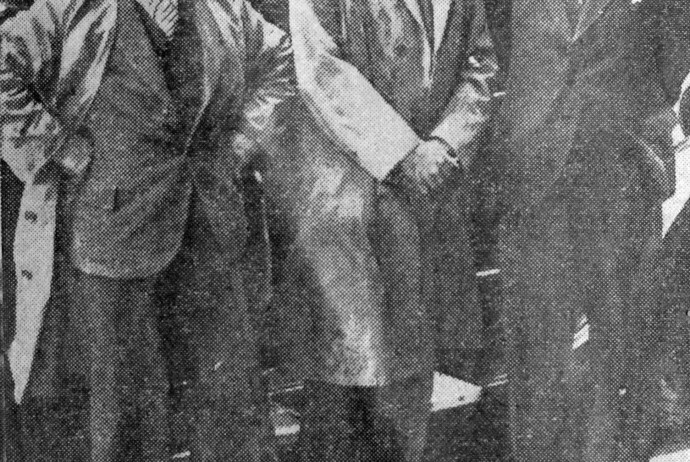 After it was announced in late July 1931 that Nurmi would compete in the Glasgow Rangers Sports on Saturday 1 August, the city was buzzing with excitement. Just the previous weekend he had established a new world outdoor record for two miles in Helsinki, in the process becoming the first man to break the nine-minute barrier. 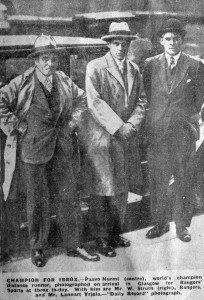 The Rangers’ manager “Billy” Struth had truly surpassed himself by bringing the world’s greatest distance runner to Ibrox. Imagine the impact Usain Bolt might have next year if he comes to Glasgow and competes for Jamaica in the Commonwealth Games. 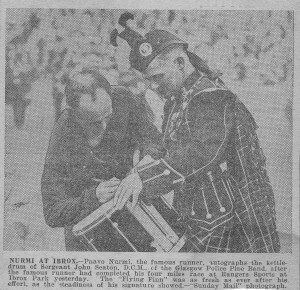 Nurmi arrived in Glasgow on the eve of the Rangers Sports and was suitably impressed by the condition of the track after a two mile canter complete with stopwatch and dressed in a loose fitting sweater and training pants, declaring it the best track had yet set his eyes on in Britain. A huge crowd of 50,000 spectators – a record for a Scottish meeting – turned out the following day. Afterwards athletics aficionados would be unanimous in agreeing that there had never been a finer meeting in the long and successful history of the Rangers Sports. Four records went by the board that afternoon. 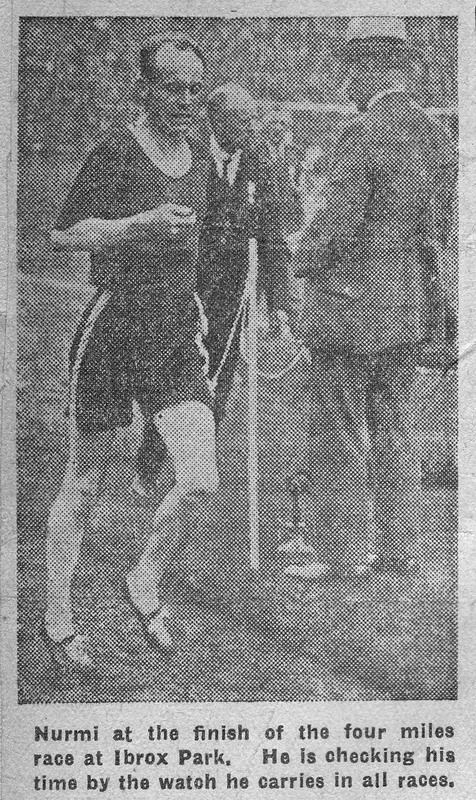 First, Tommy Riddell, of Shettleston Harriers, broke his own native record for the mile by 3 seconds with a time of 4:18.0 set when winning the handicap off twenty yards, then running on to complete the full distance, while in the same race Cyril Ellis , of Birchfield Harriers, returned 4:15.2, which was three-fifths better than Albert Hill’s all-comers’ record at Parkhead in 1919. For all that, Paavo Nurmi was undoubtedly the main attraction, his event being a specially framed four mile handicap. 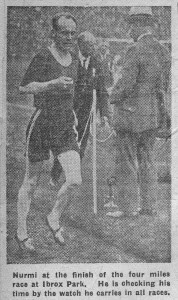 Alfred Shrubb’s British and Scottish all-comers’ four mile record of 19:23.4 was Nurmi’s chief goal, and it was expected that the would probably come close to his own world record of 19:15.6. The track had been specially prepared for the record attempt and the weather conditions were ideal. Nurmi covered his first mile in 4:45.4, during which he failed to made much impression on Jimmy Wood, with 200 yards start, who was busily pounding his way round the track, himself intent on setting a record. The Finn passed the two mile mark in 9:41.6 and on completion of three miles in 14:36.0 had only made up 8.2 seconds on Wood. The Heriot’s F.P.A.C. runner put up a brilliant performance to take two-fifths of a second off the previous native record for the distance, set in 1904 by John McGough (Bellahouston Harriers), the former Greenock postman and now a farmer in Ireland. Realising that he was behind record schedule, Nurmi piled on the pace in the last mile, to such effect that he made up twelve seconds on Shrubb, clocking a new British all-comers’ record of 19:20.4. Meanwhile, Tom Blakely, of Maryhill Harriers, took full advantage of a 400-yard start to win the handicap in 19:11.6, beating Walter Beavers, of York Harriers & AC (200 yds. start), by 15 yards. Wood, beating 20 minutes for the first time, ran home third in 19:50.4, ten yards ahead of the the fair-haired Finn , but 5.2 seconds outside the Scottish record by Arthur Robertson, of Birchfield Harriers. Later in the afternoon Nurmi went out for the record at two miles, but was clearly tired after his earlier exertions and never got anywhere near the leaders or the record. The following year Nurmi elected to do the 10,000 metres and marathon at the Los Angeles Olympics. In late June he smashed the world record for 25 miles in the Finnish trials with a time of 2:22:03.8. He was made a strong favourite for gold in LA, but was denied the opportunity to win a tenth gold medal by a rather dubious and politically motivated eleventh-hour ban passed down by the IAAF on grounds of professionalism. 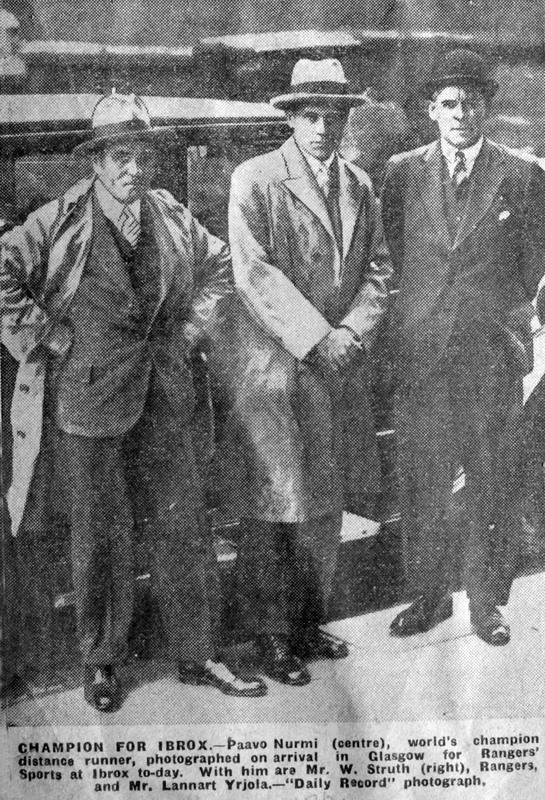 The Ibrox sports of 1931 were the last time Britons would see Nurmi running in their country. You never know, maybe there are still a handful of nonagenarian or centenarian Glaswegians around who can still remember when the great “Flying Finn” caused a furore in their city. Thanks, Alex, for a fascinating report on a great, but virtually forgotten, occasion.